Candidates can easily download the APPSC ASO Syllabus 2019 in PDF format for every subject. So, candidates who are eagerly searching for the latest APPSC ASO Exam Syllabus can directly stay on this article. 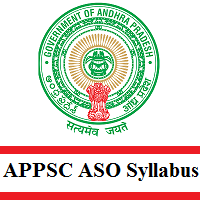 You can note down the correct APPSC ASO Exam Pattern with the psc.ap.gov.in ASO Selection Process 2019 in the below sections. Furthermore, the Andhra Pradesh Public Service Commission (APPSC) is going to declare the Assistant Statistical Officer Mains Exam Date Shortly. To the end, we have given the direct link to download the APPSC ASO Syllabus 2019 PDF. In the above table, candidates can note down the exact APPSC ASO Prelims & Mains Exam Dates, the official site address of the organization @ Andhra Pradesh Public Service Commission (APPSC). Apart from those, you can get the post name and the number of vacancies available. Candidates should attend the psc.ap.gov.in ASO Selection Process 2019 to get placed as the Assistant Statistical Officer. So, check the below given process. Furthermore, you need to make sure that only if you qualify the initial test, then only you will be promoted to further levels. While starting the preparation process, all the candidates need to check the important APPSC ASO Exam Pattern 2019. Without getting an accurate test pattern, candidates cannot attempt the test properly and cannot prepare even. So, do collect the correct information from the below table. Now, you all need to do is refer to the below tables to get the clear Prelims & Mains Exam Pattern 2019. Also, there is a negative marking of 1/3 rd for every wrong or incorrect answer. Come and check this section to identify the complete APPSC ASO Exam Syllabus 2019 topics for each subject for the upcoming Examination. Furthermore, the officials of the Andhra Pradesh Public Service Commission (APPSC) had published the exact Prelims Date as 19th May 2019 whereas the Mains examination will be conducted in the month of August 2019. So, till that date, you can start preparing for the Assistant Statistical Officer Exam by referring to the APPSC ASO Syllabus 2019. Down are the topics listed for each subject. We hope that all the APPSC ASO Syllabus 2019 information is beneficial for your reference. So, to get all such information and exciting news, you need to keep in touch with us on our web portal @ Freshers Now. Also, comment us under the below section for any query so that we can easily respond to you.